There are metals of all kinds that can be recycled, including iron, brass, copper, e-scrap, and much more. One of the most commonly recycled metals is aluminum. Aluminum is used in a wide variety of household items, and it loses almost none of its quality after being put through the recycling process. Perhaps you have aluminum items that you’re thinking about recycling? Maybe you’re wondering if they can, in fact, be recycled? We’ve put together a list of commonly recycled aluminum items. We hope it helps you with your recycling efforts! 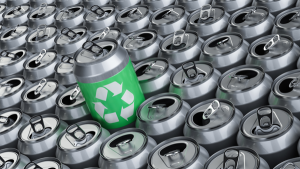 Perhaps the most commonly recycled metal item is the pop can. Pop and beer cans are recycled in mass numbers and are typically picked up by municipalities in an effort to encourage recycling. If you’re living Chicago, you likely have aluminum pop cans that could be recycled. Aluminum is used for just about everything, and furniture is certainly not an exception. Aluminum chairs, in particular, are quite common. For instance, if you have lawn chairs or patio chairs, there’s a good chance they are made out of aluminum. Fortunately, these chairs can be recycled. If they’re still functional, they can be donated to various organizations. However, if they’re not functional, they can be liquified and used to make new aluminum products. Just as aluminum chairs can be recycled, so too can aluminum tables. Often times, foldable card tables are made out of aluminum. However, standard, stationary tables can be made out of aluminum as well. Again, if your table is still functional, it can be donated to a variety of different organizations. If it’s no longer functional, it can be melted and used for manufacturing purposes. Aluminum foil is so thin and compactable that people often don’t think of it as a metal. However, it is, and it can be recycled. If you’re going to recycle aluminum foil, you’ll want to ensure that it’s clean first. Most metal recycling companies will not accept aluminum foil which is contaminated by food or other substances. Aluminum is commonly used to manufacture a wide range of products. If your company manufactures aluminum products, you could very well have left over aluminum scrap hanging around your factory or warehouse. As is, this aluminum scrap is probably entirely useless. However, once a metal recycling company gets its hands on it, it can be melted down, and used to serve a number of different purposes. Did you know that some kitchen and bathroom sinks are made out of aluminum? Well, they are, and they can most certainly be recycled. Depending on its size, you can make a decent chunk of change for handing your sink into a metal recycling facility. A sink of this type can be liquified and then used to manufacture other aluminum goods. There are tons of sporting goods out there which are made of aluminum. Equipment such as baseball bats, boat paddles, tennis rackets, golf clubs, and ski poles are just a few of the sporting goods that are made out of the popular metal. Fortunately, all of these items can be recycled. As long as they’re clean and void of contaminants, recycling centers will accept them. Looking to Recycle Aluminum in Chicago? Are you in possession of any of the items reviewed above? Interested in recycling them? If you’re looking to recycle aluminum in Chicago, we here at Central Metal Recycling can help you. We collect and recycle aluminum items of all kinds, paying you top-dollar in exchange for these metals. Our team of recycling specialists would love to work with you. Contact us today to start recycling! © Central Metal Recycling, LLC. All Rights. Reserved.